The importance of cataloging the ISS microbiome, which consists of both culturable and unculturable microbes, parallels the surge in research into the “built microbiome” here on Earth. 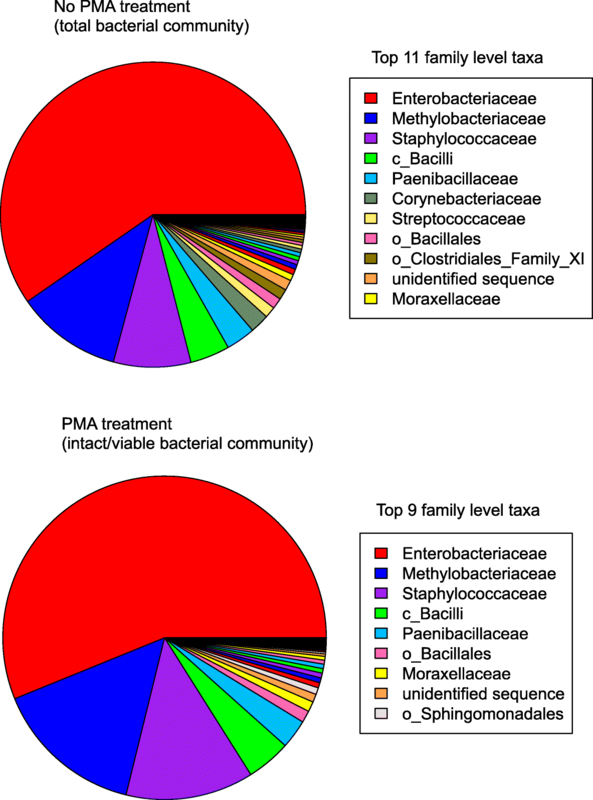 Emerging studies on the microbiome of homes [9–11], offices, classrooms, museums [12, 13], and hospitals [5, 14, 15] have revealed an assemblage of bacteria, fungi, viruses, and protozoa unique to that indoor environment that are influenced by a variety of factors such as building design, ventilation, humidity, air pressure and flow, occupant numbers, or activities performed [16, 17]. Specific microbes in these indoor spaces have been shown to impact human health by influencing our susceptibility to allergies, infectious diseases, or sick building syndrome . The influence of the indoor microbiome on human health becomes more important for astronauts during flights due to altered immunity associated with space flight [19, 20] and the lack of sophisticated medical interventions that are available on Earth. In light of an upcoming new era of human expansion in the universe, such as future space travel to Mars, the microbiome of the closed space environment needs to be examined thoroughly to identify the types of microorganisms that can accumulate in this unique environment, how long they persist and survive, and their impact on human health and spacecraft infrastructure. For this reason, the National Research Council (NRC) Decadal Survey recommended that NASA establish a coordinated, large-scale Microbial Observatory program within the ISS platform . As part of this NASA initiative, the microbial communities on ISS surfaces from eight defined locations over three flight missions, spanning 14 months, were characterized using culture-based techniques, qPCR, and amplicon sequencing of the 16S rRNA gene and internal transcribed spacer (ITS) region. Before DNA extraction, half of the sample was treated with propidium monoazide (PMA) so that the microbiome of intact/viable cells (PMA treatment) could be characterized. The PMA-untreated samples yielded information about the total microbial population (including free DNA, dead cells, cells with a compromised cell membrane, intact cells, and viable cells). PMA binds to DNA, making the DNA unavailable for amplification during PCR steps . Due to its higher molecular weight and/or charge, PMA cannot penetrate into cells that have an intact cell membrane (i.e., viable) but can bind to free floating DNA or DNA inside cells with a compromised cell membrane (i.e., dead cells) [22, 23]. It is in this way that many studies have utilized PMA to distinguish between intact/viable cells and compromised/dead cells [2, 24–26]. Many of the organisms detected on the ISS are known to form biofilms that belong to both bacterial (Acinetobacter, Sphingomonas, Bacillus, Burkholderia, Corynebacterium, and Klebsiella)  and fungal (Penicillium, Aspergillus, Cryptococcus, and Rhodotorula)  genera. This could pose problems for astronauts if they do become infected as biofilms are known to promote resistance to antibiotics . Also, biofilm formation on the ISS could decrease infrastructure stability by causing mechanical blockages, reducing heat transfer efficiency, and inducing microbial influenced corrosion . Some of the microorganisms that were identified on the ISS that have been implicated in microbial-induced corrosion on Earth are Methylobacterium, Sphingomonas, Bacillus, Penicillium, and Aspergillus [43–46]; however, the role they play in corrosion aboard the ISS remains to be determined. Elucidating the potential ability to form biofilms and the magnitude of actual biofilm formation on ISS surfaces is important during long-term space missions to maintain structural stability of the crew vehicle when routine indoor maintenance cannot be as easily performed. 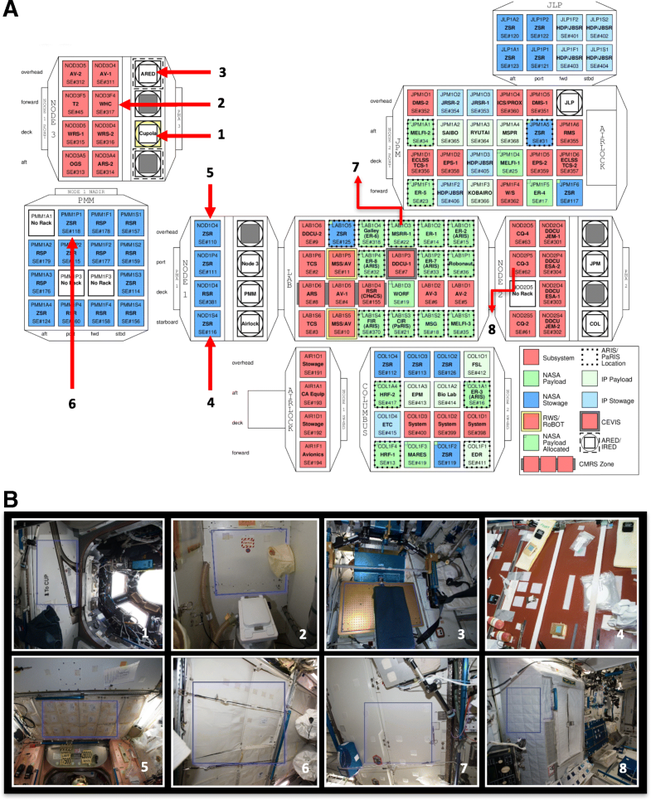 Members of the family Staphylococcaceae and Enterobacteriaceae were the most predominant organisms on ISS surfaces of the US module, similar to what has been published for the Japanese module of the ISS , and were detected in almost every sample by both culture and amplicon sequencing (Additional file 1: Figure S10). Both are human-associated organisms, with Staphylococcaceae commonly found on the skin and in the nasal passage, and Enterobacteriaceae commonly associated with the gastrointestinal tract. These two taxa are also abundant in fitness centers , office buildings , and hospitals , suggesting that the ISS is similar to other built environments on Earth, in that its microbiome is shaped by human occupation . On Earth, it has been observed that incoming intensive care unit (ICU) patients have a significantly higher risk of acquiring infections if the previous occupant was a carrier, despite terminal cleaning of the bed and the room [55–57]. Thus, habitation of the same area, regardless of whether individuals interact or not, may contribute to disease spread. Further studies assessing how long organisms survive on ISS surfaces and how readily they can be passed on from one individual to another in space can lead to the development of countermeasures to minimize the spread of infections from one astronaut to another during simultaneous or even separate flight missions. 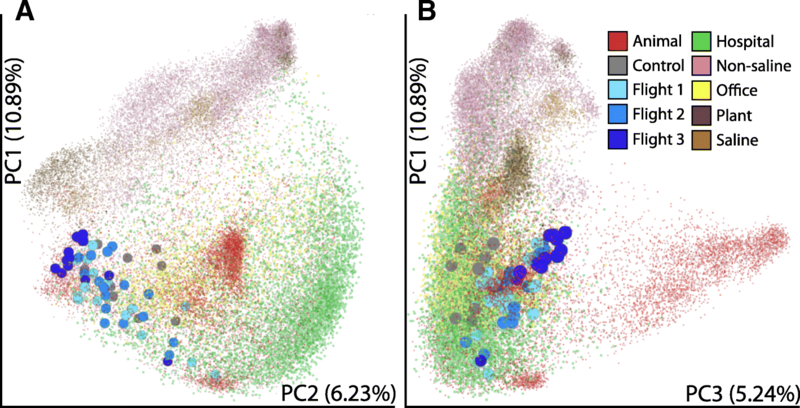 Numerous studies conducted on Earth have shown that the type and amount of human activity in a particular location impacts that indoor microbiome [65–67] and while there were no differences in the average microbial load (by culture and qPCR) nor community structure (amplicon sequencing), it was clear that there were variations between sampling points across different locations. Among the eight locations sampled (Table 1), location #6 (permanent multipurpose module [PMM] port 1) exhibited low concentrations of cultivable (Fig. 2), viable (Fig. 3a), and total (data not shown) microbial burden. The PMM is a specific location within the Node 1 Nadir module of ISS (Fig. 1) to store bags intact as opposed to open and place them into racks. Minimum crew activities are expected in PMM location #6 and hence microbial abundance might be minimal compared to other locations that are heavily occupied by astronauts in a day to day activities such as observing window cupola (location #1), toilet (location #2), ARED exercise platform (location #3), dining table (location #4) performing several experiments, or sleeping quarters (location #8). In a study performed by Mayer et al. in an inflated lunar/Mars analog habitat, the cultivable bacterial load was in the range of 103–105 per m2 after the student crew inhabited the analog station. 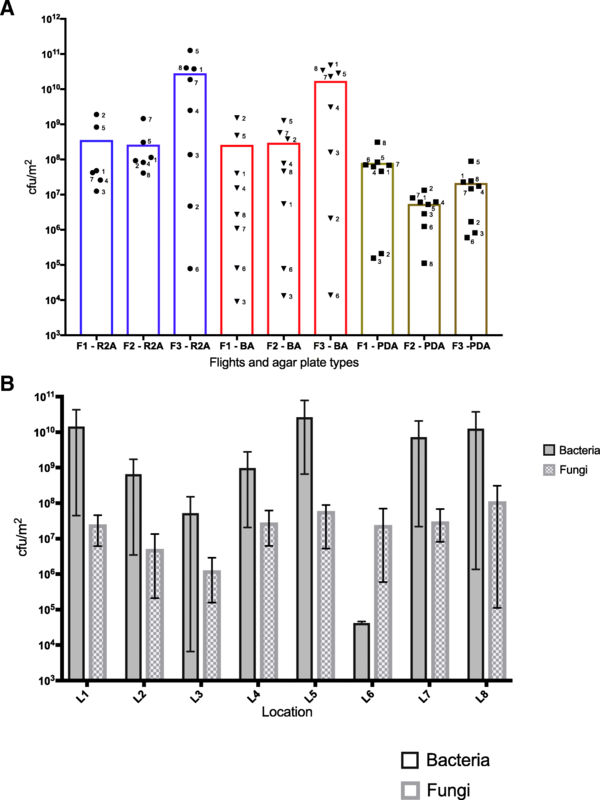 There were no significant changes in microbial load between the more active areas like the laboratory and other locations, while bedroom cultivable bacterial load increased toward the end of 30-day occupation. The fungal cultivable population was lower than bacterial, but it was in the range from 102 to 104 per m2 . In contrast, the ISS results showed that cultivable microbial load were not uniform between locations and warrant more study.